Welp. Christmas came and Christmas went. And I seriously cannot believe that it is over already! I swear it snuck up on me so quickly and came and went faster than the blink of an eye. It's what we've been building up towards all month and it feels bittersweet that it's over. To some extent, I'm excited to get my house at least partially organized again, but at the same time, I'm sad that all the decorations have to go. I feel like I didn't get to do nearly half of what I had wanted to do this month. Next year, I vow to plan better to make sure to take some days off work and just enjoy the season instead of always being so busy! After dinner, presents, and dessert, we came home and set up for Santa! Friday was Christmas Day. We woke up early and opened presents at our house before heading over to Seth's mom's house for breakfast and to open more presents. Mason, again, was so excited to open his presents but really only liked the toys. When he'd open a book or clothes or shoes, I'd ask him if he liked it and he'd say "no" and throw it to the side. But give him a toy to open, ask the same question, and you'd get a "YEAH!!!!!!". Such a sweet boy. He was so excited! The rest of the weekend was spent at three different malls on four different occasions. The day after Christmas I hadn't intended on going shopping, but my sister in law and I had a couple things to exchange at Hanna Andersson so I decided to go with her. We had the most impeccable timing because we found parking so easily when we got there, the food court was nearly empty, and the stores were pretty bare able. However, when we left it was a complete nightmare. After we left that mall, we had intended on heading home but I mentioned that I wanted to get some sheets for Mason's new bed (he got a twin bed for Christmas!) so we ended up going to another mall that had Pottery Barn Kids. This mall is one of the biggest in the county and was EVEN WORSE than the mall we just left. I immediately said oh never mind, let's just go, this is insanity, but my sister in law said we'd try down one aisle and if we couldn't find a parking spot, we'd leave. And lo and behold, someone was backing out right then. I swear we have great mall karma. So, we parked and headed in and the store actually wasn't that bad. I actually found an Elf on the Shelf on sale (which I couldn't find a sale ANYWHERE) as well as an Elf Pet reindeer so I snatched those up for next year (yep, we're doing Elf on the Shelf next year! I don't know if I think I am crazy or if I am excited?!). Then I found THE CUTEST sheets for Mason's bed as well that were 20% off. After spending way too much money, we we left the mall and headed back home where we played tons of new games and hung out for a couple hours. Seth and Mason joined us as well as some friends and we all had leftovers and played another round of Pie Face. I swear the game never gets old. It's just as funny to see someone get pied in the face the first time and the twentieth time. Sunday was spent doing an insane amount of laundry (all the new clothes!) as well as a trip to the grocery store. Then we headed to a different mall to meet family for lunch at Panini Cafe (if you have one nearby and haven't been, GO! SO GOOD!). After lunch I realized that we were close to the store that I got my current purse at and I've been dying for a cross body bag and asked Seth if we could stop over real fast. We went in to the mall, I wasn't impressed, and then decided that I wanted to go to the Fossil store (back at mall #2 from Saturday) so we headed back for our 4th mall trip of the weekend. I spent more than I thought I would on a purse but found one that I love! Success! We came home, took a little trip across the street to the park, and finished laundry and just hung out. It was a nice, quiet evening after a crazy busy couple of days. But I wouldn't have it any other way. Now it's back to work for a few days and then another long weekend of fun! We have plans to hang out with some friends on New Year's Eve and then head out to the Rose Parade on New Year's Day so it's sure to be a fun, busy weekend again! Wow you guys were busy! That hot chocolate bar looks amazing! That pie game sounds hilarious but I don't think Noah (or I) would like to get messy. But man Seth has a cool grandma! Yay for finding the elf on sale! You will have so much fun next year... And how cute to get the reindeer too! I love that Mason "got it" this year; doesn't that make it so fun?! And what a little cutie in all his honesty of not loving the clothes... haha! How many malls do you guys have by you??? Jealous! 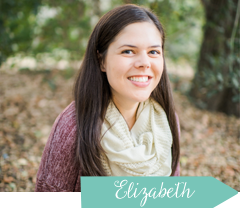 Glad you had such a great Christmas, Elizabeth! Sounds like ya'll had quite the weekend of Christmas festivities & mall trips ;) I swear that Pie Face game is taking the world by storm! I'm a little jealous Santa didn't bring us one! You guys were so busy but it sounds like it was a blast! Plus, the picture of the cinnamon rolls - yum! Im so glad you had days off to enjoy Christmas! Sounds like you have a good game plan heading into next year (its never too early!) SCORE on the sale Elf! Im still torn about wanting/ not wanting to do it lol. But hey, Crystal shared that smart monthly planner on moving the Elf around that will definitely come in handy! Merry Christmas friend! I love all the pics! That hot chocolate bar look perfect and such a good idea! This was the first year my daughter actually got it too and it was so exciting! I keep seeing that pie game all over, looks fun! I swear the end of the year snuck up on us too! I can't believe Sophie will be two next year. Mason's Christmas toys look like so much fun! Especially that ABC car. I love all of this delicious food! You are brave for going to the mall, not to mention 4 times!! Holy cow girl. I would've needed some wine after that. I saw your videos on IG/FB too and they were so funny! Sounds like a great Christmas all around! That hot chocolate bar looks superb! Sounds like you guys had the merriest of Christmases! (Of course, I wouldn't expect any less.) Love all of the sweet pictures of Mason! What a fun Christmas! I love that he was so honest about not loving the boring gifts! Hahaha! And I now really want to try the Pie in the Face game! Hilarious! What a perfect Christmas! You guys are adorable! Don't mind me, just over here living in the middle of nowhere, being jealous that you have multiple malls with stores I would actually want to shop at. Haha! Wyatt was the same way--opening everyone's gifts! Especially since we took gifts from our home to Fayetteville so he just assumed they were all his. ha! So glad y'all had a merry Christmas! The Guys Behind the Blog // December Edition. Holiday Cards with Minted + a Sneak Peek!